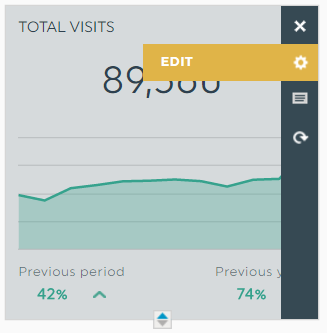 Editing at the widget level has been a long-awaited feature for most of our clients. It is now possible to create a widget and modify its related data, be it metrics, dimensions, segments, or filters! While it isn’t possible to switch to a different source (for example, to go from Google Analytics to Facebook Ads), it is nonetheless possible to modify things inside a given source. To do this, first, go into your dashboard’s Edit mode. The widget will then refresh itself. Voilà, you’re done! Note: this will re-create the widget, with the new configuration. As such, any pre-existing formatting will be lost in the process, and the widget will position itself to the first valid position (i.e. the “hole” in the dashboard). The title will also stay the same by default, so don’t forget to modify it if you want to! This entry was posted in Widgets and tagged widget. How to add a markup on metrics?